At the 2001 Rambler Rodeo and Trade Show many companies have displays showing off the products that they hope to sell to farmers in the area. But, this display really caught my eye. The pictures at the top and bottom of this page truly tell of the way agriculture has changed and identify what it is today. Continuous cropping has meant a lot of changes in farming practices and the most important of those has been the dependence upon chemicals to allow for zero tillage and suppression of weeds. This development has come about as farmers have struggled to find a means to produce the most product off of their land and do so with the smallest output of operating expenses. This striving for increased productivity is the most important element in modern agriculture but it has put the farmer into the dire straights that faces them. Their increased productivity has kept them on their farms when the economic forces brought about by government policy should have rendered them unable to continue. 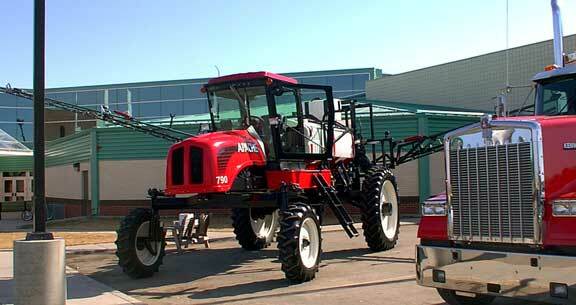 This ungainly chemical application machine is now an every day part of big time farming, they suppers weeds spring and fall, apply chemicals through the growing season and in many ways have taken over the role of general farm implement that once was the job of the tractor. But these are expensive highly specialised machines and in general most farmers do not buy them but rather pay companies to do this work for them. Essentially all the talk of corporate farming is not about some problem in the future it is the present system of farming. The picture below is even more telling because not only has the method of farming shifted from tillage to chemical application so has the transportation of the final product. Grain is no longer moved by farm truck to elevator then to railway, it is now moved from the farm by massive tractor trailer commercial "B" trains. This shift has, unlike the movement to chemical farming, which increased productivity and profitability, has added a huge amount of extra expense to agriculture. Not only is the grain hauled further to elevators but the elevation costs have risen disproportionate to the supposed efficiency of large terminals, then the cost of transportation to market has increased equally so that transportation now costs more than production of the product. All in all the story of modern agriculture is in these two machines, chemical application and trucks. The future of modern agriculture is still not in sight as the low capital gain from the process is preventing the next and obvious development in the industry to automated mini machines that will handle the chores of agriculture unattended, but that's another story.